It is hard to review Celt-Punk music of any pedigree without referencing The Pogues. This is especially true when the CD is the new release from London based Celtic Folk Punkers, Neck. The obvious tie-ins are there: Tin whistles, Irish themes, traditional covers et al. 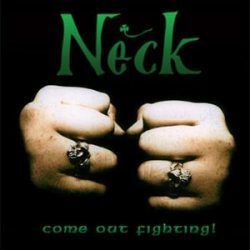 There really is no denying the obvious influence, but influences aside, “Come Out Fighting”, the new release from Neck, still stands on its own two feet. This, their first official US release (in this modern age, do national boundaries really mean that much for music relases?) proffers 14 tracks of dashing daring and swaggering and a cover of MacAlpine’s Fusiliers (can’t go wrong with that one). The blend of modern and traditional keeps things lively and encourages the whisky to flow freely. Admittedly I have a particular bent for punked up traditional Celt/Folk sounds, but I imagine that I’m not exactly alone in that. If you’re a fan of Dropkick and/or Flogging Molly then “Come Out Fighting” is a perfect addition for your audio collection. On a slightly related note, the tin whistle parts throughout track four, “Tink” could easily find a home in an Irish style cover of Centerfold from J. Geils Band. I think it’d make a bang up cover. So if any of you up-and-coming McBands out there want to grab a sweet idea, it’s all yours. Bottom line: Solid Irish influenced Rock and Roll with a leaning towards the Punk side of rock. I would have gone slightly higher on the star-o-meter, but for a couple of too slow tracks, but hell, that is my call to make. Come Out troid a théann!